Having a go at this. Read the Lua 5.0 manual.. nice language! Problem is this is my first lua program. What I tried to do was rewrite a nice little script to move a sprite along a bezier line I wrote with another language. 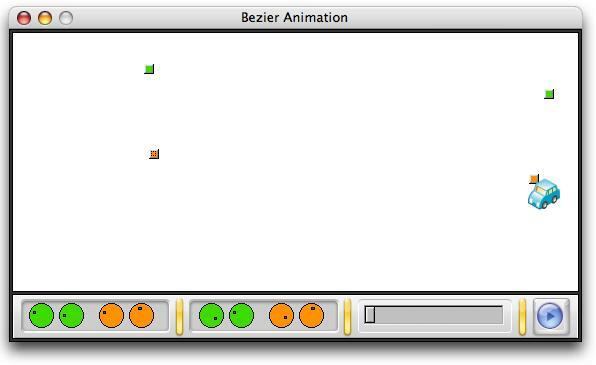 As I don't know how to make a drag and drop, I use dials to specify the position of the two orange points that makes the extremities of a bezier curve and two green points to define the position of the control handles. This part works nicely. What I can't figure out how to manage is the animation business. I defined the part of the script that will move the sprite as a coroutine and I resume that coroutine when the user press on the play button. This works when I force an onscreen event to occur (having a message box display a message). This doesn't work anymore when I remove it. Is this a Lua issue? This post was last modified: 05-28-2007 10:07 AM by widged. much simpler... now I only need to understand how to get an animation to run each time I press on that play button. This post was last modified: 05-28-2007 07:34 PM by widged. This post was last modified: 05-28-2007 07:35 PM by widged. This is awesome, I'm glad you found it something you could roll with. This post was last modified: 06-05-2007 02:09 PM by iGame3D. This is a groovy test. I'm wondering if I'm seeing it the way it's supposed to be, though. Rather than gradually moving across the window as I expected, the car appears to leap very quickly between a pair of points. It seems to be animated in the sense that I can see the car very briefly at a middle point, but the movement is so quick I'm not sure if it isn't just an optical illusion or if the car is being redrawn as quickly as possible (no wait) at each point along the curve. On my iMac this is very smooth and Marielle has the same iMac specs mostly. This post was last modified: 06-05-2007 02:10 PM by iGame3D. Attached is an animated image sequence demo. Ok here's my version. Auto Plays on start. Space bar starts and stops the animation and you can control the animation speed in the script. This post was last modified: 06-25-2007 10:43 AM by iGame3D. That's pretty cool. I definitely have to look into that autoplay. Unfortunately it will need some tweaks to work on my system.